Welcome to Term Life Insurance for Males, where we specialize in helping males age 46 to 50 obtain low cost term life insurance quotes. Whether you are in excellent health or have a history of medical issues, as independent agents, we will impartially shop your case amongst our many life insurance companies to help you find the lowest premium available. In your late forties, the most common reason our clients request term life insurance quotes is to protect against loss of wages. Say you’re a healthy 47 year old male, making $75,000 per year, with a wife, children, and a mortgage. You’ll probably work another 20 years, so if you were to die unexpectedly, you’ll never have the chance to earn that income ($1.5 Million in this case), so many men buy term life insurance to replace some percentage of that lost income. 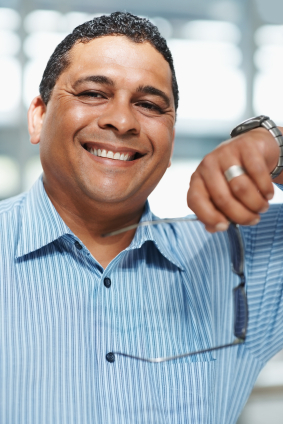 We also help men ages 46 to 50 purchase term life insurance for business insurance, mortgage insurance, or for estate planning purposes, but these are less common. Below I’ve provided quotes for 20 year term life insurance, for a non smoking male is excellent health, under the health category “Preferred Plus”. See my notes below for different amounts or health ratings. *Please note the prices above are Monthly Premiums based on rates as of 9/2/2011, and are subject to change. If you’d like a quote for a different amount, try using our instant quote form on the right. You might start by quoting yourself in the “Preferred Plus” health class if you’re in great health. The results will allow you to compare term life insurance rates from over 100 companies. If you take any medications or have a history of any medical impairments, you should start off quoting yourself at “Regular”. Keep in mind our instant quote form on the right will give you an idea of insurance premiums, but in order to obtain accurate term life insurance quotes, you’ll need to speak to an agent, to discuss other factors that may affect your health rating, such as your family’s health history, and whether or not you participate in any hazardous activities, travels, or work in a dangerous occupation. Once you lock in a term rate for 10 to 30 years, your premium is guaranteed to stay level throughout the duration of that term. But let’s say you’re age 47 today and are considering the purchase of a 20 year term life insurance contract with ING for $500,000. The preferred non tobacco rate for you is $743 per year. A male at age 48 will pay $813. That means if you put off your life insurance purchase for just one year, your premium will jump $70 bucks, or a whopping 9%. The cost of waiting is even more severe as you get older. For example a 48 year old healthy male will pay $1265 for a 30 year level term policy with Banner Life Insurance, but that same policy will cost him $1390 if he waits just one year until he’s age 49, constituting a one year increase on your life insurance rate of 9.9%. In both of the scenarios above, you also risk not being able to qualify for as high of a health rating by waiting a year. People generally get less healthy as they age is the theory as opposed to healthier, correct? That being said, apply for coverage today. If you’re in good health and are in your late forties, lock in the best rates you can now! You aren’t limited in types of term policies available until you hit age 65, so you can qualify for any term length from 10 year guaranteed level term all the way to 30 year term, even at age 50! When you purchase term life insurance, you’re “fixing” your premium for a certain period of time. For example, if a 47 year old purchases a 10 year term policy, his premium will stay level for the entire 10 years. If you need protection for a longer period of time, you’ll also want to call us about the cost of whole life insurance, or another type of permanent policy, such as universal life insurance. Both of these are able to provide coverage for your entire life, or can be structure to give you level payments to age 95, 100, 120 as well as many other target ages. You have two simple options to apply for life insurance coverage. First, after completing our quote form on the right, select the policy that suits your needs best, and click “Request Application”. One of our agents will then call you to confirm you can qualify for the rating class you selected and assist you in the completion of your application. Your second option is to call us directly to complete your application over the phone at 877-996-9383. Either way, we are excited about helping you get the best term life insurance quotes, and look forward to speaking with you about your insurance needs.